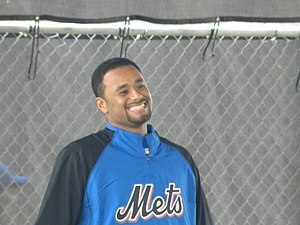 The Mets had Johan Santana back in the bullpen again today for 73 pitches. He looked good as you can see by the video below and, presumably, he felt good too. The best news is that he’s throwing regularly. This is his third session since getting to PSL. And he just threw in the bullpen on Thursday. The plan is for Santana to start a game a week from Tuesday. But pitching coach Dan Warthen thought that Santana needed to make some adjustments after today’s session. He told the media that Santana needs to straighten up to pitch on more of a downward plane. Check out the video from Newsday. Santana looks like he’s throwing close to 100%.